The Douglass beach is located just outside of the village on Lakeside. Soft sand and shady trees on the shores of Brome Lake make this the best place to beat the heat and enjoy and outdoor lunch. Officially open from June 24th through until August 20th. There are toilets, picnic tables, showers and a life guard on duty during official operating season. There is a fee for parking that starts at 7$ per day. There is a lovely walking trail that leads to the beach from Landsdowne and Victoria street so if you prefer to save the parking fee take a walk through the woods and you'll reach the beach which is within easy walking distance (about 2 km). Swimming is also available at the exclusive Brome Lake Yacht Club at 221 Lakeside but annual membership is required ($725 per family). The phone number is (450) 243-523. Another popular picnic spot is in the center of the village in the Mill Pond Park right beside the dam. The waters cascade into the Coldbrook and there is often arts events and music happening during the summer weekends so it is a lively place for a picnic and great for taking a break from shopping in the village. The Lions Park in Knowlton on Center Street, across from the Brome Lake Duck farm maintains great fenced in tennis courts that have well cared for nets, not sagging like in many public courts! Also at the Lions Park in Knowlton: Skateboard ramps, basketball court, softball diamond, football and soccer fields. There is also a basketball court and some kids playground apparatus available right beside Knowlton Academy which is located on Victoria Street near Landsdowne Street. In winter there is a hockey rink that is maintained behind the Knowlton Academy and on the hill that leads down to the Coldbrook is the perfect winter sliding and tobogganing hill for the kids! Also during the winter a small public rink is often built in the small park beside the Mill Pond Dam in the center of Knowlton. There are some peaceful walking paths in Knowlton that are perfect for a quick stroll and none of them require special hiking shoes as most are simply pedestrian paths through the woods and are well maintained. One trail starts near the Mill Pond Park and winds along the Coldbrook before heading up the hill to Knowlton Academy and then winding towards the beach and beyond to the North. Toms Bike Shop, 231 Knowlton Road, is the best place in town to have quick repairs done or to buy new bike bikes and gear. Tom also carries skateboarding gear. This trail winds from Waterloo to Bromont and is an easy distance to peddle. The trail head is only a 15 minute drive from Knowlton. 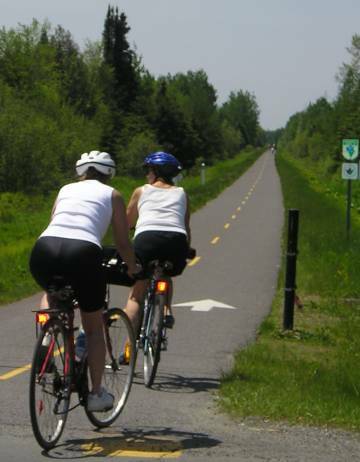 Cycling in the Eastern Townships offers many choices from paved easy rides to more extreme mountain biking trails. The Visitors Information Center is located on Lakeside right in the heart of Knowlton beside the Mill Pond Park. A booth is operated during the summer season and contains information on all recreational activities and complete listings of things to do in the Eastern Townships. Another tourist information booth is located in the historical train station near Foster at the intersection of highway 243 and highway 215 near the Knowlton Golf Club. This information booth has a more complete array of guidebooks, maps and event schedules for the Eastern Townships tourist region. While many people stay at one of the Hotels or beautiful Bed & Breakfasts in the Knowlton area there are also fantastic opportunities to enjoy some camping. Domaines des Erables , located at 688 Bondville, is a large camping and family activity site perfect for an outdoor vacation. The campsite has 185 sites and offers a full range of camping services. They have a dumping station, a corner store and snack bar, laundrymat, an outdoor pool as well as a boat launch and rentals. A full community hall and games court make this a perfect spot for a vacation in the Eastern Townships. 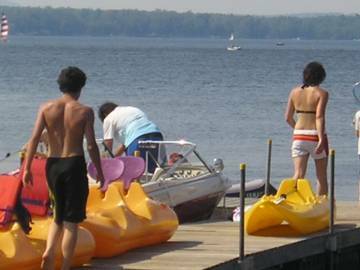 Visitors can enjoy many activities on Brome lake including water-skiing, kayaking and wind surfing. There are boat and canoe rentals at the Knowlton Marina which is at 78 Benoit Street. The Marina also offers a power boat launch and fueling services as well as an outdoor lounge and restaurant. There is also a free boat launch on Lakeside road right beside the Auberge Quilliams. The launch is perfect for kayaks, windsurfers and canoes. There is also a picnic area here and a toilet. For the more discerning of residents and visitors there is the Brome Lake Yacht Club on Lakeside. Since 1901 this exclusive yacht and summer country club has provided members with superb service and recreational facilities. There are tennis courts and a full range of summer activities for all members of the family. Membership and annual dues are required and current family memberships are $725 for a year. Golfing in the Eastern Townships offers a choice of many challenging courses that combine incredible scenery with luxurious facilities. There are many other courses available in the vacinity of Knowlton as well so ask at the visitros information center about the choice of golf courses. Golf Inverness is located at 511 Bondville on the shores of Brome lake, not far from the village of Knowlton. The lovely course has 18-holes where golf lovers will find each fairway and green more surprising than the last. All greens are well protected with one or two sand traps and two of every three include a water hazard to bring out the best in you. Three different skill levels with separate tee-off areas. Brome Lake Golf Club is located at 700 Lakeside near the tourist information booth. The course is only 3 kilometers from highway 10 at exit 90 at the door to Brome Lake. The "Club de Golf Lac Brome" is for the golfer who enjoys a fair challenge and has already become known as one of the best Executive golf courses in Qu�bec. This par 3-4, nine-hole course is nestled right in the heart of the Eastern Townships.